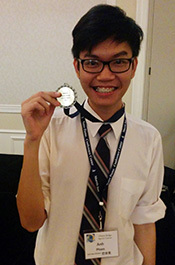 The Anh Pham, a Wabash College freshman from Hanoi, Vietnam, won the gold medal at the U.S. Midwest “Chinese Bridge” Speech Contest, April 18, on the campus of the University of Notre Dame. Pham’s winning speech, titled, “How to be a Real Man,” discussed three main points: being respectful, being responsible, and never shying away from love. 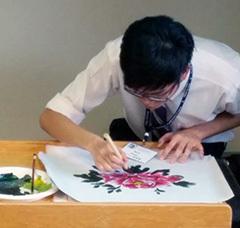 In the talent portion of the program, he wished all prosperity and peace to all by drawing a Rock’s Peony with traditional Chinese painting techniques – a simple brush dipped in ink – in only three minutes. 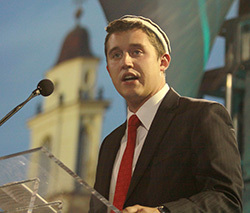 It marked the first time a Wabash student had participated in the competition. Now in its 14th year, the U.S. Midwest “Chinese Bridge” Speech Contest promotes Chinese language and culture education in the Midwest and strengthens exchanges between college-level Chinese programs in the region. All non-native undergraduate and graduate students of Chinese language in the Midwest and Great Lakes areas are eligible to participate. The winning effort was a culmination of work by Pham and I-Ting Chiu, Visiting Instructor of Chinese. After spending time researching topics and integrating ideas, Pham and Chiu settled down to a rough draft in early April, using the last two weeks to rehearse and sharpen Pham’s delivery skills. Pham’s victory was especially rewarding for Chiu as well. Pham drew this during the talent portion of the contest. The competition was a learning experience in itself for Pham, opening new perspectives on language acquisition. We have all heard it before – the Wabash alumni network is an influential group of men across the globe ready to offer advice, internships, and personal mentoring. Is it true or just marketing hype? Jacob German ’11, an associate in the Governmental Services and Public Finance Department of Barnes & Thornburg LLP offers his insight into Wabash, Law School, and the alumni who have helped him get there. 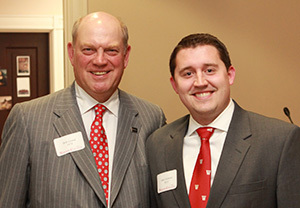 How have Wabash alumni influenced and mentored you in your young career? Bob Grand ’78 has been a fantastic friend and mentor for almost a decade. Kyle ’11, his son, is my pledge brother. Bob always came back around campus and the Beta house, offering advice and opportunities to eager students. Even though Bob’s world moves a million miles a minute from coast to coast, he still took the time to discuss with me the pros and cons of law school and the changing dynamic of the law practice. Bob guided me through the difficult waters of the current legal market, helping me realize the intersection of my passion (government/politics) with a niche of a legal practice. For years, Scott Himsel ’85 challenged me to an intellectual duel on the nuances of Supreme Court decisions and policy determinations. He is the best at taking a stand on one side of the argument, possibly even agreeing with your point of view, and then completely turning your argument against you. In that moment you realize he has taken you exactly where you did not want to go – the weeds, alone. But it really is a fascinating mental exercise. The great thing about his class is that he cares as much about the students as he does about teaching the students. He is our law advisor – law school, legal profession, applications, letters of recommendation, bar applications, etc. He’s our guy, in our corner. David Shane ’70 played football with my dad at Wabash nearly 40 years ago. Dave has been a legal professional in Indianapolis for a long time; he sat with me, and strategized about what firms to apply to, what other jobs to look at, what area of the law would I enjoy and excel. He took me under his wing and made sure I had all the information while trying to make my way as a lawyer. He helped me reach out to people all over the city. Without him, I would not have made half of my connections. Nelson Alexander ’90 took the time to meet with me. I am not sure if he would remember our 20-minute conversation three years ago. But, it made a tremendous impact on me. Every person needs someone in their life to be completely, bare bones, honest with them. Nelson was that to me. He discussed the legal marketplace in a way I had never heard it described. He discussed the number of opportunities in firms around Indianapolis. He was very frank. It helped me see the complete picture. I worked for Jeff Been ’81 at the Legal Aid Society of Louisville. He takes Wabash guys interested in the law, puts them to work, and allows them to interact with clients. I also worked for Greg Miller ’83 at his law firm. He allowed me to meet clients, research, and help with his law practice. That was the first time I think I fully grasped the volume of work in a legal practice. I mention all of these experiences to say this – I am a big believer in picking your own board of directors. Pick people around you who you trust and who are “for you.” But, that is not what networking and mentoring are all about. We, as students and rising professionals, need to have people in our life who take us under their wing, or tell us the real truth about the legal profession, or throw us in the deep end and let us work, and finally be our friend when things are tough. My professional life would not be the same without each and every one of these guys and many, many others. How many Wabash alumni do you work with in your current position? I work primarily with three Wabash alumni. Jeff Qualkinbush ’88 is our department administrator. I work on a daily basis for Brian Burdick ’91 and Bob Grand. Brian is the Indianapolis managing partner and Bob is the firm managing partner. Both are practicing governmental service attorneys. How did Wabash prepare you for law school and your current position? Wabash engrained a deep sense of time management. Law school is unique because nothing really matters until the final exam; however, if you don’t continue to work and read and interpret all semester, there is no way to succeed on the final. Wabash demanded a masterful grasp of reading and writing, not only persuasively but effectively. My job requires a high attention to detail. We use details to form the foundation of arguments, which persuades our different audiences. 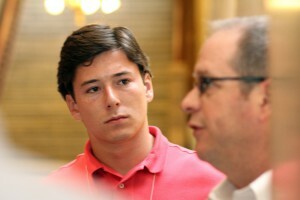 What advice do you have for a student considering Wabash? Wabash College is unique. Be it the all-male institution, our campus involvement, our alumni network, our competitiveness, our swagger. It’s just different. Wabash is not for everyone. We want the do-ers, the guys who are involved, passionate students. Wabash is not some place you go for a passive education. You are one of 900. You matter. What I tell a student is jump. Come test yourself. Try, on a small scale initially, to remove yourself from safe harbors. Your life will be better because of it. The more you put yourself out there and make that connection, the better you are the next time and the next time. People think certain people are better in interviews than others or are better at networking than others. The difference between people who are good and who aren’t is practice. The people who take the leap and put themselves in those situations grow and mature and find success. That’s why I encourage students to come to Wabash. It forces you to leap. What’s your number one tip for networking? Diversity is good. Far too many people confine themselves to comfortable groups. Branch out. Our biggest asset in the beginning of our professional careers are alumni who are older than we are. They know the game and who keeps score. But, don’t forget about your peers. Stay in touch. We are the next group in line to take over, and if you stay in touch with your peer group, they will be the decision-makers of tomorrow. Interested students, all from Indiana private colleges and universities, are invited to attend one of three such sessions during the year. Joining the Wabash crew were representatives from six other institutions. Many of the Wallies in attendance were from Professor Shamira Gelbman’s PSC111 class “Introduction to American Politics,” and this was their first exposure to state government. An introductory meeting at the Indiana Historical Society set the tone for the day. There, ICI staff members explained the two-fold purpose of Lobby Day. First, it’s a chance for students to introduce and interact with state senators and representatives. Secondly, through such contacts and hand-written notes, it lets the students actively lobby those legislators on the topic of educational funding. Michael Lumpkin ’18 listens to lobbyist Kip Tew at the Indiana Statehouse. Founded in 1948, the ICI purpose is to advance the interest of students both at the Statehouse in Indianapolis and in Washington, D.C. The organization represents more than 100,000 students on 31 campuses throughout the state with a goal of creating citizens that contribute to society. While at the Statehouse, the students were able to tour building, including both the senate and house chambers and committee rooms, and talk with legislators and lobbyists. In fact, the group was able to speak directly with lobbyists Kip Tew and Michael Biberstine ’00, as well as state senator Randy Head (R-18) ’91. The day concluded a meeting with Kelly Mitchell, Indiana State Treasurer. Mitchell, who was elected to the office in November, talked about her job responsibilities, Indiana’s conventioning process, and the rigors of running for political office.